In the spirit of the season and how amazing it feels to share the gift of baseball with others, the Bisons today announced an all new 'Season of Giving' program. For every ticket package sold during the month of December, the team will donate four (4) undated flex tickets for any April game in 2019 to a local 501c3 non-profit organization of the ticket-buyers' choice. 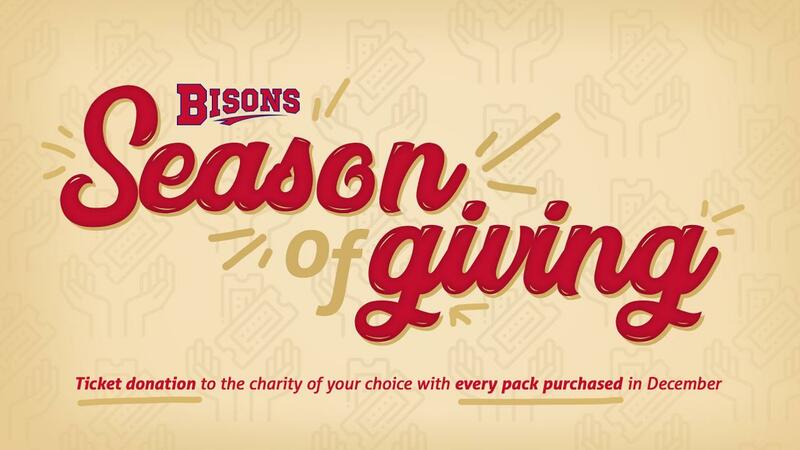 The 'Season of Giving' will run through the entire month of December and include both renewals and new ticket package purchases made at Bisons.com, by calling (716) 843-4373 or by stopping by the Sahlen Field Box Office (Mon. -Thu. 9am-3pm, Fri. 9am-1pm). Those that purchase a ticket package can provide the name of any registered 501c3 organization to be the recipient of the donated tickets or allow the Bisons to choose one of the many great causes the team currently works with. The Bisons have a number of great ticket packages currently available that would include the donation of 4 undated flex tickets to a worthy cause. Season Tickets (starting at $525) -See all 70 Bisons games in 2019 with over 50% in savings and the most exclusive rewards and benefits package in sports. CLICK HERE for 2019 season ticket info. 12-Game Flex Pack ($138) -Receive 12 undated flex tickets that can be used for any game and in any combination throughout the 2019 season (excludes July 3rd). Family Pack ($81) -Receive four undated tickets, $30 in Bisons Bucks and 25% off at the ballpark gift shops (excludes July 3rd). Event Packs (starting at $80) -The Bisons also have special individual ticket packages for next year's Star Wars Night, KeyBank Independence Eve Celebration with the Buffalo Philharmonic Orchestra and Superhero Night.